888VoIP, a leading distributor of VoIP solutions, has been named a Yealink Platinum Distributor for the sixth consecutive year. For six years running, 888VoIP has received the prestigious designation as a Yealink Platinum Distributor. 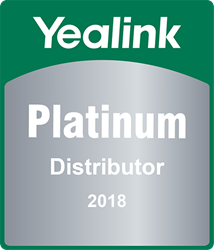 For the sixth consecutive year, Yealink, a leading Unified Communication solution provider, has named 888VoIP as a Platinum Distributor. 888VoIP received this designation due to unwavering commitment and dedication to Yealink throughout 2017. By emphasizing partner support, provisioning capabilities, imperative support programs, and thorough attention to customers’ needs, 888VoIP has been able to successfully distribute Yealink products. 888VoIP’s consistently growing channel of Resellers, Service Providers, and Integrators has also assisted in the obtainment of this Platinum Distribution distinction. "We are again honored to be recognized as a Yealink Platinum Distributor for the sixth consecutive year," said John Molino, CEO of American Technologies, LLC., "Our focus on working together with Yealink and paying attention to the needs of our customers is key to our continued success." 888VoIP carries a vast array of Yealink solutions, including the innovative CP960 conference phone, high-performance W60P DECT IP phone system, and sophisticated T5 Smart Media Phone Series. Yealink has continuously added advanced technologies to their product mix, which have met and surpassed the ever-changing needs of 888VoIP partners. Based upon the past success of this partnership, 888VoIP foresees strong continued success with Yealink in 2018 and beyond. In addition to the wide range of Yealink products available through 888VoIP, the distributor also offers managed partners access to their Channel Advantage Program. Channel Advantage allows partners to focus on their customers while 888VoIP’s knowledgeable expert team handles back end procedures and processes. Channel Advantage services include provisioning, technical support, advanced API, training and education programs, full cycle logistics, and customized marketing materials. For over ten years, 888VoIP has been a leading distributor of VoIP hardware and software solutions. 888VoIP is committed to driving the customers’ success and does so by identifying and understanding customers’ specific requirements and unique needs. By providing customers with the most innovative products, full cycle logistics, wholesale discounts, dedicated staff, and access to the Channel Advantage program, 888VoIP can assure the success of partners’ projects. To learn more about 888VoIP, visit the website or follow 888VoIP on Twitter.